Dental clinics are looking for well-rounded assistants with a good blend of customer service skills, up-to-date dental knowledge, and the desire to improve the office’s patient experience. One of the best ways to convey your capabilities as a dental assistant is through the cover letter; we’ve created a dental assistant cover letter example and offer industry-specific tips so you can convince dental offices that you’re the perfect new addition to their team. Keep scrolling to learn how to write a compelling dental assistant cover letter. We also offer a resume builder for job seekers who need a cover letter constructed in minutes. Looking at other job industries? Our cover letter library has more careers to choose from. I’m glad to have the opportunity to apply for the position of Dental Assistant at Dental Health Partners Boston. Your practice is known for its innovative dental practices and comprehensive patient service. As a dental assistant with 10 years of experience, I believe my skills would make me an excellent addition to the practice and help uphold Dental Health Partners Boston’s trusted reputation. At Cowell University, I earned my Bachelor’s in Dentistry before becoming a registered dental hygienist in 2006. In addition, I am radiology and x-ray certified. Working as a hygienist requires technical knowledge and the ability to work with a diverse patient base. At Open Wide Practice in Boston, I counseled patients on proper oral hygiene and nutrition. I also worked regularly with physically/mentally handicapped patients to provide preventative dental care. To effectively serve our patients, I implemented Dentrix management software into the office, increasing office productivity by 25%. I extended my skills into pre-operative and post-operative preventative dental services for surgical patients at Twinkles Surgery in Boston. As senior dental assistant, I evaluated my patients’ oral health and assessed lab reports to determine whether patients were medically cleared for dental prophylaxis. On top of my dental duties, I created a comfortable environment for patients through conversation and bilingual services in Spanish. With my expertise and commitment to learning, I am excited for the opportunity to make an impact to Dental Health Partners Boston. I can be contacted at [PHONE NUMBER] or by email at [EMAIL] for further discussions or arrangement for an interview. Thank you for your time, and I look forward to hearing from you soon. While the majority of dental assistants work in dentists’ offices, their duties vary from state and each office. Dental assistants may provide general patient care, take x-rays, organize patient files, and take over secretarial tasks such as greeting patients and scheduling appointments. If you have skills that fall outside the realm of dentistry, show how you can apply these additional talents within the dentist office to demonstrate your unique capabilities in your cover letter. Describe the specific duties you have done as a dental assistant in the past, letting your employer know whether you’ve worked extensively with office management software or handle all your office’s x-ray services. In this sample cover letter, the applicant mentions his dental work with surgical patients and a familiarity with evaluating lab reports. The more detail you provide into your work history, the easier it will be for your potential employer to determine if you are a good match for their office’s needs. While experience is something employers will always look for, you need a dental education and certifications to be able to practice in the first place. Spend at least a sentence or two to let the hiring manager know what services you have trained in. Each state has its own requirements and exams towards becoming a dental assistant, so make sure your certifications are valid if you’re applying for jobs away from the current state you reside in. 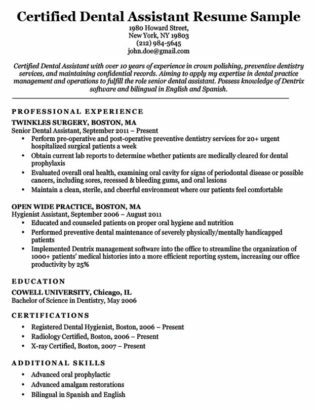 If you have skills that fall outside the realm of dentistry, show how you can apply these additional talents within the dentist office to demonstrate your unique capabilities in your cover letter. For example, this applicant is bilingual, and he explains how he conducts dental consultations in Spanish for patients who may not be fluent in English. Other talents worth including may be working with specific patient demographics like children, the elderly, or the handicapped, or possessing computer skills. Have what it takes to be a dental assistant? 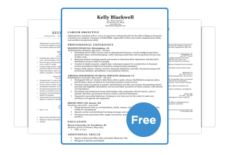 Showcase your qualifications using a professional cover letter format from our free templates page for an application that has both substance and style. For a streamlined process, use our cover letter builder to have a completed letter ready to hand in to the hiring manager in just minutes.